The IT roadmap takes on enhanced importance for the technology leader as they move from operator to strategist. Here is why you need one and why your functional counterparts should be supportive. I have come across several companies recently who do not yet have an IT roadmap. In each situation the technology leader has said they want to be more strategic: they have visions of tech that pushes the business strategy forward and they have heard great stories about cloud/mobile/digital/social/etc. Unfortunately, they work in a cycle of reaction that manages to short-term needs rather than strategic priorities and many cannot find a way out. Enterprise software is a victim of this cycle. Since it’s complex and pervasive it requires constant feeding by the IT department. Because it’s used to support fundamental business functions users frequently request new functionality. This makes it difficult to adopt the newest, most exciting technologies available because the immediate priorities are always fixing what exists. CIOs themselves recognize this. Steven Norton (@steven_norton) at the Wall Street Journal (@CIOJournal) summarized the Top 5 priorities for CIOs this year. Two of the five are directly related to strategic vision (the other three are all related to security and risk). The question becomes: “how?” The answer often lies in a new roadmap. A technology roadmap can help the CIO act more in line with the strategy of the organization. It benefits both technology leaders and functional leaders and encourages collaboration that results in true executive alignment on existing and new investments. A sample IT Roadmap. The time horizon and categories should be customized for your business. This graphic should be supported by the slides outlined below. A strategy statement with the list of the strategic priorities for the business (not IT-specific). 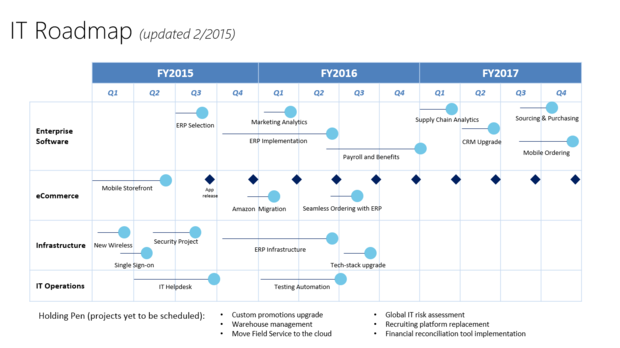 A timeline of the initiatives and projects that will occur over the next several years with approximate start and end dates, durations, and sizes. A prioritized list of improvement opportunities. This is generated jointly by the business and IT and should be refreshed periodically. High-level justifications for each project. These should be robust for projects over the next 12 months and simpler statements for projects past the 12 month horizon. The estimated cost and duration for each project. This is specific and reasonably accurate for projects occurring over the next 12 months and can be vaguer for projects that go out farther than that. An owner for each project. This is the sponsoring executive or delegate directly overseeing the project. For projects in the next 12 months it should be the specific person and for projects beyond that it can be the owning executive. Systems architecture diagrams of the whole enterprise including interfaces, manual data movements, and platforms (this is not an infrastructure diagram – this is just systems specific). A systems inventory that is periodically updated and contains at least end-of-life dates, basic statement on usage, number of users, and system owner. A running list of emerging problems the IT support staff is seeing. Good help desk software should be able to track this for you. The IT leader will use it to facilitate investment discussions with the rest of leadership. The IT leader will use the roadmap as a baseline when discussing new projects or priorities with functional executives. It will help leadership understand how to balance investment and project priorities and provide a way to visualize tradeoffs. The IT department will use it to improve planning for projects and resources. The roadmap will help them anticipate resourcing needs, plan assignments, software and vendor selection, and costs ahead of time, and make it possible to start visioning and planning with the functional owners well in advance. Functional leaders will use it to understand what is required of and will be delivered to their departments. It helps them clearly understand how they should balance existing roadmap initiatives with new requests. The roadmap will keep functional leaders aligned on strategic technology priorities across the enterprise. Active management of the roadmap will result in much better executive alignment and stakeholder buy-in before projects even begin. Act strategically when making investment decisions and managing projects. Make securing buy-in from business leadership a more structured processes which, in turn, makes it easier to earn buy-in from business users. Negotiate more effectively with leaders or staff who request new projects or initiatives that require significant, non-operating effort. The roadmap allows functional executives to be strategic when they request new or improved technology. They can use their functional strategies to begin working with IT leadership to determine which types of technology projects will be required to achieve their goals. The roadmap provides transparent resourcing needs for when business staff will need to be assigned to IT projects, clear traceability to costs, and the detail for why those resources and dollars are required. Most importantly, it provides a strategic, structured manner of governing changes to business needs as they arise. It makes sure there is a technology voice at the table when decisions are made that require IT support, and it encourages balancing priorities across the business, diffusing conflict before it arises. The roadmap clearly spells out why the projects they are working on are important and, as things on the roadmap move or are re-prioritized, it forces the leaders to explain why and how those priorities are shifting. The roadmap encourages a clear and regular line of communication between leadership and staff. The business needs to fully participate in the development process. In fact, if the CIO reports to anyone other than the CEO, I recommend the sponsoring executive sit outside of IT. Because of the strategic nature of the document and how critical leadership buy-in will be, it will need support at the highest levels of the enterprise. If you are a technology leader: you need to push the executives to support the development of an IT roadmap to help you invest strategically and have structured conversations around investment with the other executives. If you are not a technology executive: you should be pushing your organization to develop a roadmap so you can act more strategically in your area and benefit the business holistically with new investments. Steve Ronan helps companies use technology, process and talent initiatives to drive their strategies, increase profits, and reduce costs. Steve is the founding principal of Ronan Consulting Group, LLC and is based in Stamford, Conn.